Silly Mommy : Baby on the way! On December 10th, we found out we are expecting number 5! We are very very happy!! I hit 12 weeks today which is a huge milestone. As most of you know, between our children we've had a few miscarriages, so to be able to get pregnant and keep a pregnancy two times in a row is a miracle! Its never happened, so we are beyond thrilled. So, this wasn't a "surprise" but it kinda was...we were hoping to be pregnant soon but had no idea how soon it would happen. It happened pretty much immediately:) TMI! Sorry yall. haha. Whats even neater to me is that we didn't even plan to start trying until January but I had this feeling we should start sooner, so we decided in November to go for it. I don't think that was just a feeling, I know it was a prompting. This is definitely when this baby is supposed to join our family. My due date is August 18th, so another lovely summer pregnancy, but hey, we have a neighborhood pool so its all good:) I'll just get to be all cute and prego at the pool all summer long. I felt so sick from week 6 up until now that I thought we were having twins. I was so nauseated all day long and had absolutely no energy. Worse than any other pregnancy. There were days when I had to really force myself to get out of bed. Or to get off the couch to fix lunch. So its been a rough 6 weeks(especially because we also have put our house back on the market and in just one month, we've had about 15 showings, which means a LOT of work), but thankfully the morning sickness is tapering off some and I'm getting some energy back. And of course its all worth it in the end. 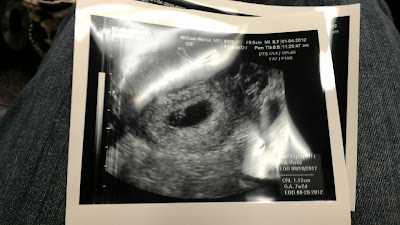 And no, we aren't having twins:) Sonogram showed one beating heart (I have to admit major relief:) Here is our babies first photo...taken at about 7-8 weeks...and in just a few more weeks we'll find out if its a boy or girl. I'm so excited for that sonogram!! And I'm so excited to meet this little boy or girl in August! Yay. I am so happy. New babies are always a blessing. We are grateful for our 12 grandchildren and now for our soon to be 13th. Makes for a great reunion of sorts at all gatherings. First pictures are always great. Love Ammon's new photo on the side such a happy lil guy just like his papa when he was that age.